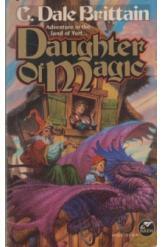 Daughter of Magic by C Dale Brittain, Sci Fi. Book is in good condition, all pages intact. Daimbert has his hands full. Teaching magic to the daughter of a witch and wizard is one thing, but when he simultaneously has to deal with a pair of headstrong noble twins, a runaway king, and an invasion of the living dead, it stretches him thin. Worst of all, the evil wizard Vlad has returned for revenge against Daimbert personally. Part of the Yurt series.